​The Right Reverend Gladstone B. “Skip” Adams III was elected by acclamation and invested as the Provisional Bishop of The Episcopal Church in South Carolina on September 10, 2016 at Grace Church Cathedral in Charleston. 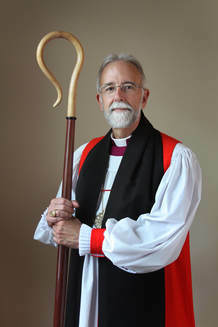 Bishop Adams served for 15 years as the 10th Bishop Diocesan of the Episcopal Diocese of Central New York. Several months before South Carolina's call, he had announced plans to retire from Central New York; his retirement was effective October 31, 2016. Based in Liverpool, NY, the Diocese of Central New York has 81 congregations and some 13,000 members, and has elected the Very Reverend DeDe Duncan-Probe to become its 11th bishop on December 3, 2016. The South Carolina diocese, which covers the eastern half of the state, consists of 31 parishes, missions and worshiping communities and has an estimated 7,000 members. Bishop Adams was born July 26, 1952. A native of Baltimore, MD, he graduated from Towson University in 1976. In 1980 he earned his Master of Divinity at Virginia Theological Seminary and was ordained in 1980. He went on to serve in churches in New York, Virginia, New Hampshire and Maryland. He enjoys fly-fishing and fly-tying, reading, music of all kinds, camping and canoeing. He is interested in the Church and people in El Salvador (the companion Diocese of Central New York), environmental and social issues. Bishop Adams’ wife, Bonnie Adams, is a registered nurse, and they have three adult children: Peter, Stephen, and Emily. View the 2018-2019 schedule here. Visit this page for sermons from the Bishop's visitations in the diocese, and other messages and reflections.